George Stoner, a freshman from Caledonia, Miss., is the first recipient of the Legacy Scholarship established by Mississippi’s First Alumnae Association. He was nominated by his sister, Megan Stoner Morgan ’08. 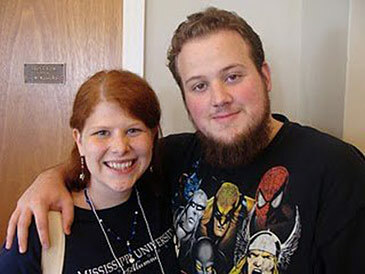 MUW freshman George Stoner, recipient of the first Legacy Scholarship presented by Mississippi’s First Alumae Association, is congratulated by his sister, Megan Stoner Morgan ’08. Stoner was home schooled and dual-enrolled at the W during his senior year where he became involved in a research project with Dr. Paul Mack, Assistant Professor of Biology, in the Department of Science and Mathematics. He maintained a 4.0 GPA in his college coursework while completing his high school curriculum. In his application letter, Stoner said he had many reasons for choosing the W. The most important reason was the quality of education he could receive. He was also influenced by his sister’s experience as a student and how well prepared she was for graduate school. The W’s professors show “particular interest in the students performing well and learning not only the material required in class but critical thinking skills that will help … throughout their lives,” according to Stoner. Mississippi’s First Alumnae Association is the historic association that has supported Mississippi University for Women continuously since it was founded in 1889. In 2009, 120 years later, MFAeA established the Legacy Scholarship to help make the W experience possible for future generations of W legacies. For additional information and an application for the MFAeA Legacy Scholarship, contact Legacy Scholarship Chairwoman Anne Franklin Lamar at annefranklinlamar9@gmail.com or 662-822-4874. Mississippi's First Alumnae Association's Legacy Scholarship is awarded to one family member of an alumna/us who has been admitted to MUW as a new, full-time student. The amount of the Legacy Scholarship is $2,500. MFAeA Scholars must maintain full-time enrollment and a quality point average of 3.0. Additional information may be obtained from www.msfirstalumnae.com.